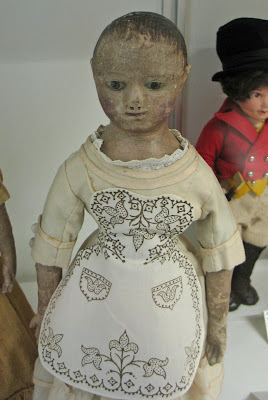 We drove 10 hours with two boys to visit the Strong Museum, primarily so that I could see the antique dolls and particularly the Izannah Walker dolls. We had to take the trip in two days going down and two days coming back, because traveling is hard for kids, and particularly for a child with autism. This is what happens when you have a passion, though - it affects the family vacation plans. 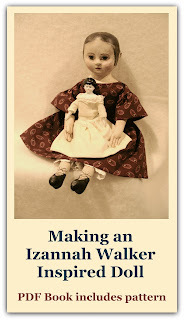 ;-) You can see that gathering information about Izannah Walker and pictures of her dolls is a passion of mine! As I mentioned previously, the Strong Museum allows people to freely take pictures for personal study. 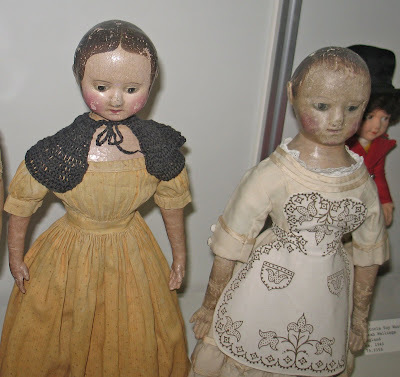 It is with their permission and generosity that I am able to post the pictures of the antique dolls here on the Izannah Walker Chronicles. So if you have a chance to visit, or make a donation their way, please do. I apologize for the ghosts in some of these pictures, which are the reflections of my camera (or sometimes me!). 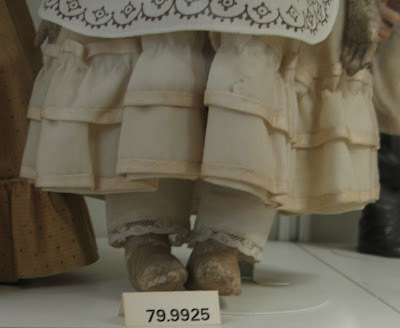 It was virtually impossible to get good side view shots of the dolls without getting some reflection. The pictures below are of the "Aproned Izannah" that is on the far right of the picture above. 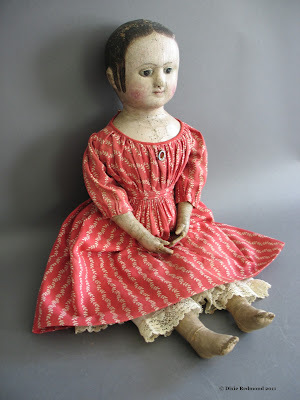 She seemed to be one of the most primitive of the dolls there. You can definitely see the joining lines where the fronts and backs of the heads were put together. Also, she is a barefoot Izannah, which is considered to be more rare than the booted Izannahs. because some show different kinds of details. It was very difficult to get a side view of her feet. Thanks for bringing all these wondeful pictures, love them all ! Dixie the pictures and your information regarding them is priceless! THANKYOU so VERY MUCH for sharing them!!! Yum! I Love the Izzy in the golden rod colored dress!!!!!! Amazing Grace!!!!!!! So Dixie~ ARE you going to the auction on the 24th??? Wonder what the cap on prices will be with the econemy in such a dumper.....COULD be some great deals to be had~ who knows, mabey that dream you had a while ago could come TRUE!!!! The more I look at this one tho, HE looks like a BOY to me~ not a girl! The paint is all original, and you can clearly see the side part~ poor little guy~ being dressed as a girl this whole time~ much rarer as a boy too. Look at any period painting of a man or boy, and you will see this exact hairdo!